... the Oceanic whitetip shark. Few divers will forget their first ever encounter with this particular shark species. Not because their size is so impressive, it is rather their behaviour... Their inquisitiveness is legendary and well documented, and it leads to very close approaches that can initially be quite unnerving. 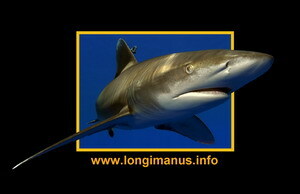 In the oceanic whitetip photo-gallery, you can watch a selection of my personal favourites. I initiated a population study on the Oceanic Whitetip Sharks in the Egyptian Red Sea in 2004. Main tool of the study is an identification catalogue created from underwater photographs and videos. If you have any footage of oceanic whitetip sharks and are willing to share it with me for my research, or if you are simply interested in further information on this species and the project, click on the banner in the top right box, which will take you to the project-webpage.